We shared with you the numbers calculated for the housing indicator: number of sales per town for 2013 in the last post. Take a look at the results of other housing indicators of the central Vermont real estate market in 2013. Average sale price is perhaps the most talked about housing indicator. The chart below illustrates the volatility of this indicator over the last 5 years. 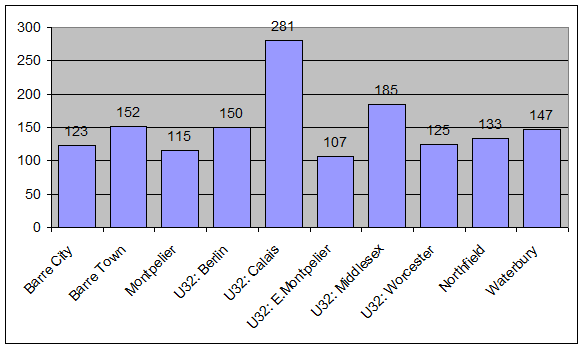 For example the U-32 towns (Berlin, Calais, East Montpelier, Middlesex and Worcester) showed phenomenal growth in average sale price in 2013 over 2012. This more than compensated for the drop in average sale price which dropped sharply from 2011 to 2012. 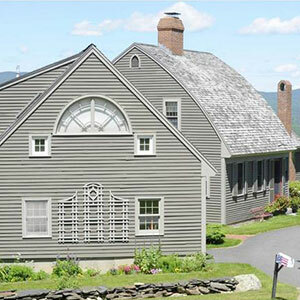 Montpelier continued to show solid appreciation with an 8.3% increase in average sale price to $239,930. 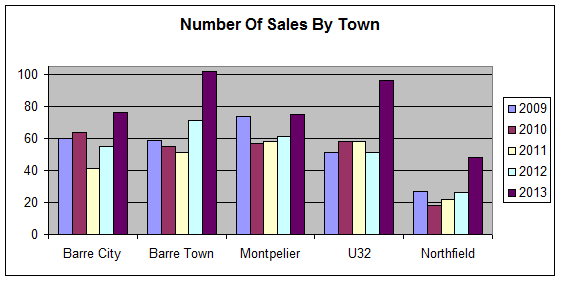 Barre Town, a leader in growth in total number of sales showed a lesser increase in its average sale price. 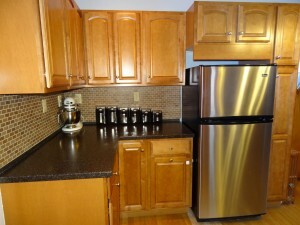 This followed a substantial $29,500 decrease in average sale price from 2011 to 2012. Waterbury's average sale price of $305,777 was one of the highest in Washington County. The average sale price of a Washington County home was $233,096 for 2013. Day on the market (DOM) is a dynamic number that indicates the number of days a property has been on the market until it goes under contract. The escrow period (between accepted offer and closing) is not part of this calculation. DOM is viewed as a loose indictor of the health of the market. Information for this one is only available for properties listed and sold through realtors. This information is not available for sales by unrepresented sellers. In addition, DOM only considers the time that a property was listed with the final listing broker and does not reflect that a seller or another broker may have previously had the property on the market. In smaller towns with fewer total sales, a few properties that take longer to sell will have an undue impact on this number. In 2012 the typical DOM was 5 to 6 months on the market and for 2013 dropped 4 to 5 months. This is a sign that the market has shifted from a "Buyer's Market" dynamic to a more balanced dynamic. Real estate is all about figures, prices and payments and if you are into property buying and selling, you need to at least familiarize yourself with these essential aspects. How is the Central Vermont real estate market? This is a frequently asked question and a good one too; the health of the housing market is an economic indicator that impacts buyers, sellers, and everyone in between. We took a look at some key indicators of real estate in Central Vermont for 2013 using data compiled from some major sources and compared these 2013 indicators to the previous four years. One major source we utilized is the multiple listing service (MLS), where the majority of Vermont real estate sales transacted by licensed brokers are recorded. 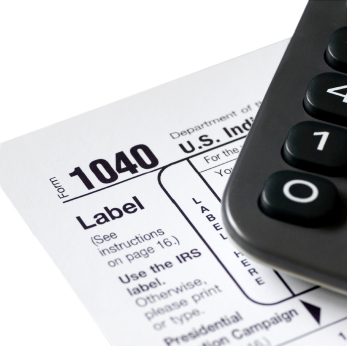 In addition to MLS, we utilized the Vermont real estate sales online database which gathers information from the Vermont Department of Taxes to create a comprehensive list of all real estate sales that may or may not be recorded in the MLS. From the statistics gathered, it is exciting to report that growth and improvement summarize Central Vermont real estate market in 2013. The information presented below will specifically be about the number of sales of single family residences in Washington County, categorized by town. In 2013 home sales increased in every major community as compared with the number of home sales in 2012. 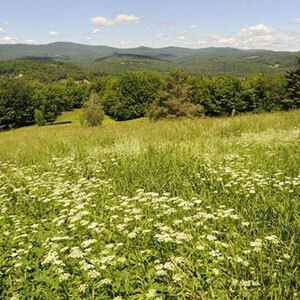 2013 also produced the highest number of Central Vermont Real Estate home sales for any year in the last five years. 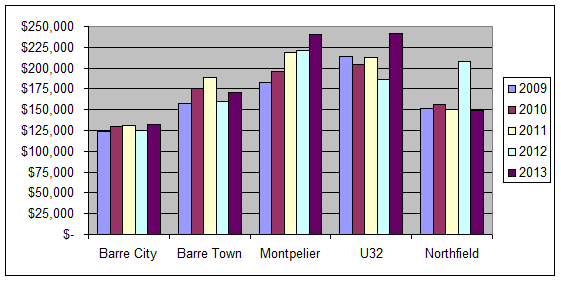 As you will note above, Barre Town posted a strong increase year after year and the U-32 towns posted an amazing 88% jump after four years of consistent numbers. Waterbury posted around 57 residential sales. Numbers don't lie. Considering the overall increase of number of sales in 2013 and the kickoff of activity we've experienced in the new year, we expect 2014 to be another year of steady growth for Central Vermont real estate. Check out what is on the market now at our new and improved website heneyrealtors.com and don't forget to visit our Facebook page! Should I do a Radon Test? Radon is a gas produced by the naturally occurring breakdown of uranium in rocks. It is not something that you can see, smell or taste. According to the Vermont Department of Health it is a class A carcinogen and a leading cause of lung cancer. Radon comes up from the ground. Houses act as a partial vacuum pulling gas from the soil. It can get into a home through dirt floors, cracks in a finished floor, gaps around service pipes, cracks in foundation walls. Are some Central Vermont homes more likely than others to have radon? According to the Vermont Department of Health, a "radon problem cannot be predicted by a home's style, age, or location". How much radon is okay? In Vermont it is recommended that radon be mitigated when levels in the air are equal to or greater than 4.0 pCi/L (picoCuries/Liter). There are free kits available from the Vermont Department of Health that takes as little as 91 days and as long as one year to produce results. Visit their website to order one- http://healthvermont.gov/enviro/rad/radon.aspx The state will also provide a 2-7 day test for $25.00, which can be ordered from their website. Most Central Vermont Home inspectors offer radon tests as part of their service. Prices vary. Give us a call if you would like a resources list of home inspectors. How do you mitigate elevated levels of radon? Typically there is a pvc pipe installed from the basement through the roof with a fan to expel the gas. Whoever installs the system should be able to hide the pipe wherever possible through closets or on the outside of the house. The Vermont Department of Health has a list of contractors approved for radon mitigation on their website. What is Radon and should I be worried about the levels in my house? 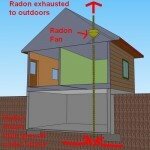 If you have questions about radon in homes, buying or selling a Central Vermont home. Give us a call! This post provides clear idea for the new viewers of blogging, that genuinely how to do running a blog. Vermonters are a pretty easy-going bunch, but when it comes to maple syrup you will be hard pressed to find ones who use anything less than high quality Vermont maple syrup. Sweet, sticky and able to improve just about every breakfast food, it is no small wonder Vermonters practically consider it a necessity. In fact from maple cotton candy, to maple popcorn, to maple creamies (our term for soft-serve ice cream), Vermonters have found ways to incorporate the delicious taste of maple syrup in many different ways. Maple sugar houses are great places to find diverse selections of maple products, but also locally made jams and spreads. If you are looking for a great family-friendly way to spend a summer day, find a local maple sugar house and sample a taste of Vermont. East Montpelier, VT- Bragg Farm: With eight generations of experience making Vermont maple syrup, Bragg farm offers an extensive variety of maple syrup, maple candy, maple sugar and maple cream. In addition, they also sell cheese, pancake mix and an excellent assortment of gift boxes. Open year round, with free guided tours where visitors can see the traditional techniques this family operated business still uses. With an ice cream parlor, gift shop and friendly farm animals, the Bragg Farm is accommodating to visitors of all ages. Montpelier, VT- Morse Farm Maple Sugarworks: One of Vermont's award winning maple sugar houses, Morse Farm Maple Sugarworks offers free sugarhouse tours and tastings to visitors. When you visit you can see the multimedia displays in their authentic woodshed theater, walk along their peaceful nature trail, drop in on their country store, and tour their outdoor Vermont farm life museum. While you are there, make sure to taste their wide variety of delicious maple products and try free samples of maple syrup. Be sure to try their maple creamies, named by the Food Network magazine as the best ice cream in VT and add maple syrup on top for the best experience! Morse Farm Sugarworks is open all year round. Northfield, VT- Sweet Retreat Guesthouse and Sugarworks: During the spring sugaring season, make sure to visit the Sweet Retreat Guesthouse and Sugarworks for their wonderful, pure Vermont Maple Syrup. With both custom Pure Vermont Maple Syrup jugs and elegant glass bottles that can have tailor-made etchings carved into them, visitors can pick up maple syrup for both themselves and as stylish personal or corporate gifts. Cabot, VT- Goodrich's Maple Farm: For seven generations since 1840, the Goodrich's Maple Farm has been a family owned and operated business. Visit their gorgeous post & beam building where guests can enjoy free educational tours and make sure to visit the sugarhouse during the springtime boiling season in order to try a local favorite, maple sugar on snow! With year round tours full of Vermont humor and a well-stocked gift shop be sure to stop by and pay them a visit. Vermont may be a small state, but if you're looking for big time sporting action Vermont has plenty of local teams to root for. If high school sports are your idea of a good time, you can find a plentitude of local teams in your area to support, however if you would like to watch higher levels of competition, there are a number of college and minor league teams in Vermont as well. The Vermont Lake Monsters: A minor league baseball team based out of Burlington, Vermont, the Lake Monsters are a Class-A Short Season affiliate with the Oakland Athletics. The Lake Monsters team plays at Centennial field in Burlington, Vermont. The Lake Monsters are very popular in Vermont and their games draw fans from all over the state. The team has produced many notable alumni including Jordan Zimmerman, Ian Desmond, Jason Bay and Milton Bradley. If you are looking for great baseball, look no further than the Vermont Lake Monsters. For more information, please visit their website. The Vermont Mountaineers: A collegiate summer baseball team based in Montpelier, Vermont, the Vermont Mountaineers have one of the most dedicated fan bases of any Vermont sporting team. If you live in central Vermont, going to see at least one game is a must. The Mountaineers play at the historic Recreation field in Montpelier, Vermont. With excellent food options, plenty of great seating and a positive atmosphere, watching a Mountaineer's game is a fantastic way to spend an evening. Positioned in one of the top spots this year in their league, a Vermont Mountaineers baseball game is experience that shouldn't be missed. For more information, please visit their website. The University of Vermont Athletics: Based in Burlington, Vermont, the University of Vermont offers a wide variety of sports to meet the needs of any kind of sports fan. These Division 1 College athletes are a blast to watch and many are at the top of their respective conferences. The Men's basketball team has consistently made the NCAA basketball tournament, while the Men's Hockey team has also done well over the past couple of years and the past graduated such well-known names as Martin St. Louis and Tim Thomas. The University of Vermont also hosts a wide variety of women's sports including women's soccer and lacrosse. For more information on UVM athletics and team schedules, please visit their website. Norwich Athletics: Based in Northfield, Vermont, Norwich University has over a dozen division 2 college level sports teams. Whether you are a fan of men's or women's sports, Norwich Athletics has you covered. Norwich Men's and Women's hockey teams and the Norwich rugby team fell just one game short of winning the division II series. Recently, the school has renovated Sabine field to include a track and walking sidewalk circling the field, a new grandstand, and a state-of-the-art press box. For more information on teams and yearly schedules, please visit their website. hi... every person...I really hope to gain some new buddies the following! At Heney, we care about more than real estate. Here's a handy calendar filled with all of the events going on in Central and Northern Vermont this August. 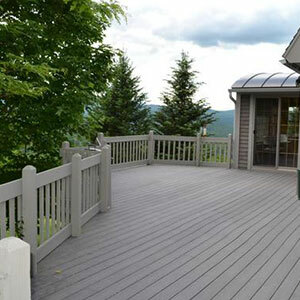 How do I prepare my Central Vermont Home for a sale? When someone contacts Heney Realtors to sell their Central Vermont Home there is a question that typically comes up. "What can I do to prepare my home for sale?" The answer varies depending on the seller's budget and time frame. No matter what, when selling a house, you want to keep everything, clean, neat and organized. 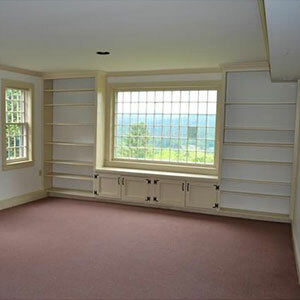 Minimize clutter to make the rooms look bigger and brighter. This kitchen has been completely redone with new appliances, tile splash guard and refinished floors. Keep the lawn mowed, hedges trimmed and power wash the siding. Of course, if you're putting your Central Vermont home on the market in February or March in anticipation of the market heating up with Spring, the lawn mower won't do you much good. In that case keep the entrances to the house shoveled and sanded so buyers can get in and out safely. If you are able to put some money into the house to prepare for a sale you have to decide where to start and how far to go. One thought is that you get the most bang for your buck from updating kitchens and bathrooms. If that's the route you want to go, be careful not to over improve. Your house should sell faster and hopefully for more money with updated kitchen and bath, but you may not get out what you put in if you're covering all the surfaces in marble and installing copper sinks with brass hardware. 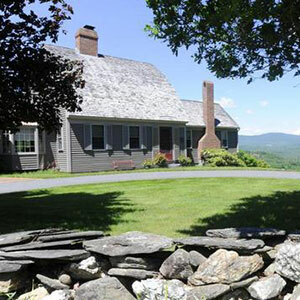 These sellers have done everything to prepare their Central Vermont Home for a sale. 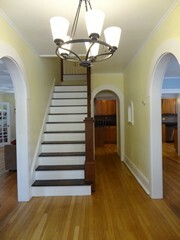 The fresh paint and redone floors make the house "pop"in the buyer's eyes. A fresh paint job does wonders to give everything a nice, clean look. If you are going to paint, pick neutral colors. The idea here is that mild colors please the largest number of people. You may have let your teenager paint the room black, or toddler sponge paint any color they wanted, but you never know who will end up buying your home. 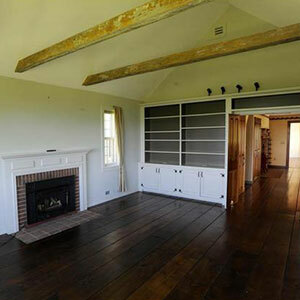 Another thing that really makes a room "pop" in the eyes of a buyer is refinished floors. Today, hardwood floors are in. Old carpet? Tear it up, sand and finish. If your floors are in pretty good shape mopping and waxing can go a long way to make them sparkle. For a lot of sellers these updates aren't an option financially. Don't worry, that's where your buyers will see potential. Wondering what your house is worth? Want to know how to get the most out of a sale? Give us a call and we'll come take a look! In addition to an actual house, when you buy real estate in the Montpelier/Barre area, you may be interested in some additional personal property. Personal property are items such as appliances, or furniture that may or may not be included in the transaction. Many items of personal property are commonly included (at no monetary value) in the sale of real estate. Sometimes other items come up during negotiations. Common examples are lawnmowers, snowblowers, tools, and yard equipment (including tractors). I've even seen a buyer ask for a canoe that was being stored in the garage. 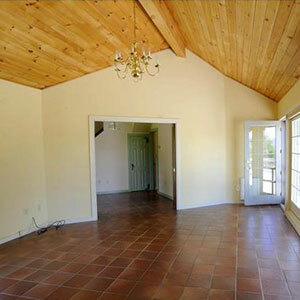 Everything's open to negotiation when you're buying a house in the Montpelier/Barre area. The glitch is that if a lender feels as if the value of the personal property is, well, some real value. Banks make loans collateralized on real estate. So if the canoe comes with the property, it's sometimes better to make a separate purchase between the buyer and the seller. On occasion, sellers are happy to get rid of things they won't need anymore. A few hundred dollars might set up a new homeowner with dining room furniture, bedframes, televisions, or more. Just make sure that everything is in writing, everything is on the level, and that the jackpot of fabulous prizes doesn't get to be more of an important factor than the real estate itself.